Phylogeny of core Malvales based on Alverson et al. (1999). The rankless names for each of the clades are indicated by a forward slash. 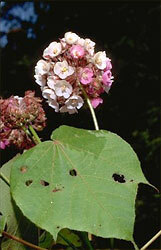 The core Malvales contains taxa traditionally divided among four families, Bombacaceae, Malvaceae, Sterculiaceae and Tiliaceae. Molecular phylogenetic analyses (Alverson et al. 1998; Bayer et al. 1999) showed that these families do not form natural (monophyletic) groups; thus a new classification of the core Malvales has been proposed with nine named clades (as shown above). In total, the core Malvales comprises approximately 2300 species in 204 genera (Judd et al. 1999). This group contains several economically important taxa, such as Theobroma cacao (the source of cocoa), Gossypium (cotton), Durio zibethinus (durians, a fruit) and many ornamental plants, such as Hibiscus, Althaea (hollyhocks) and Malva (mallows). The core Malvales share the same suite of characters commonly found in other families in the expanded Malvales, e.g., leaves with palmate venation (often three principal veins arising from the base of the leaf blade), mucilage canals within the tissues (think of the slime in Okra), stellate (star-shaped) hairs on the vegetative parts of the plant and stipules (leaf-like structures at the base of the leaf stalk). In addition, members of the core Malvales have nectaries composed of glandular hairs, usually on the calyx, and seeds with cyclopropenyl fatty acids. Molecular data from the chloroplast genes atpB and rbcL and particularly ndhF have allowed us to identify major lineages in the core Malvales (Alverson et al. 1999; Bayer et al. 1999), and in some areas, the relationships among these lineages. /Malvoideae and /Bombacoideae form a well-supported clade, termed /Malvatheca (Baum et al. 1998) in reference to their unusual monothecate stamens. The clade formed by /Malvatheca + /Sterculioideae + /Brownlowioideae + /Dombeyoideae + /Tilioideae + /Helicteroideae was named /Malvadendrina (Baum et al. 1998), although no morphological characters have been identified which unite this group. The /Byttneriina clade, /Byttneroideae + /Grewioideae (Baum et al. 1998) is strongly supported as the sister group to the /Malvadendrina although it too lacks apparent morphological synapomorphies. Althaea officinalis, commonly known as the marshmallow, is a perennial herb often found in marshy areas of Europe and northeastern North America. Its thick roots contain about 20% mucilage, the jelly-like substance used to make the original marshmallows. In the nineteenth century, the French began mixing the mucilage from Althaea roots with sugar and egg whites to make a foamy meringue that hardened to form a medicinal candy for soothing sore throats. Although the modern marshmallow gets its texture from gelatin and not Althaea's mucilage, powdered Althaea root is still commonly used in teas to treat colds and sore throats. Baum, D. A. 1995. The comparative pollination and floral biology of baobabs (Adansonia- Bombacaceae). Annals of the Missouri Botanical Garden 82(2):322-348. Baum, D. A., W. A. Alverson, and R. Nyffeler. 1998. A Durian by any other name: Taxonomy and nomenclature of the core Malvales. Harvard Papers in Botany 3:315-330. Judd, W. S., C. S. Campbell, E. A. Kellogg, and P. F. Stevens. 1999. Plant Systematics: A Phylogenetic Approach. Sinauer, Sunderland, Massachusetts. Adansonia gibbosa (/Bombacoideae) flower visited by the hawkmoth Agrius convolvuli. From Baum, D. A. 1995. The comparative pollination and floral biology of baobabs (Adansonia- Bombacaceae). Annals of the Missouri Botanical Garden 82(2):322-348. Page: Tree of Life Core Malvales. Authored by Stacey D. Smith and David A. Baum. The TEXT of this page is licensed under the Creative Commons Attribution License - Version 3.0. Note that images and other media featured on this page are each governed by their own license, and they may or may not be available for reuse. Click on an image or a media link to access the media data window, which provides the relevant licensing information. For the general terms and conditions of ToL material reuse and redistribution, please see the Tree of Life Copyright Policies.